Here at St.Emlyn’s the whole team loves a good stroke trial as they always throw up controversies and concerns about methods, outcomes and our absolute favourite ‘statistics’. That said, although we love discussing the trials we remain sceptical about the benefits of thrombolysis in stroke, with the debate about statistics, outcomes and methods raging across the internet, #FOAMed and even the main stream journals to this day. Why are we sceptical? Well, it’s because we believe in the pathophysiological argument that getting rid of clots which cause ischaemia in the brain makes sense and we also see stroke as a devastating illness. However, we also struggle to believe some of the claims about thrombolysis success because in many trials the data on effectiveness does not seem to add up. Maybe we just haven’t found the right patient group yet. In the same way that we do not thrombolyse every patient with a troponin rise, maybe we need to understand the variation in our patient populations better such that we can target dangerous therapies at those who may receive the greatest benefit. What if thrombolysis is not the only option? In cardiac care we moved from thrombolysis to mechanical (PCI) interventions and there is certainly interest in this area, although early studies have been dissapointing. This week sees the publication of a trial with a positive outcome for interventional radiology in stroke. 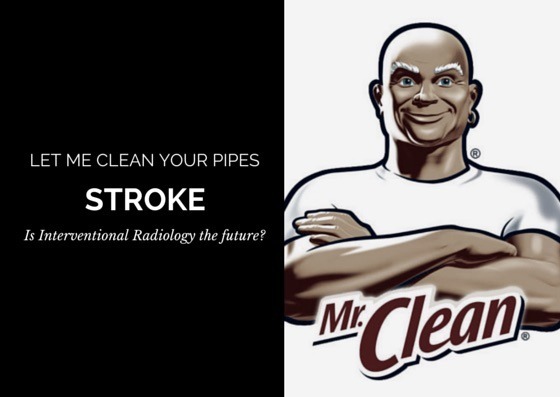 The MR CLEAN study from the Netherlands is worth a read, is open access and opens the door to interventional therapies for stroke. This is not all stroke patients and that’s really important to point out. This is a subset of stroke patients with anterior cerebral, middle cerebral or distal intracranial artery strokes as demonstrated on neuro-imaging. This group has been identified by the authors as a group who do not always re-cannulate with thrombolysis and is a group in which they feel maximal benefit from mechanical intervention will occur.Patients were treated within 6 hours of onset if they had a NIHSS score of 2 or more. Roughly 90% of patients in both groups also received alteplase before randomisation. In patients randomised to the intervention arm a catheter was guided to the site of occlusion and ‘dealt’ with. That varied between mechanical interventions or IA thrombolysis. The treating physician decided at the time which makes sense and reflects the overall pragmatic design of the trial. At first glance they look OK to be honest. The percentage of people with a modified Rankin score of 0-2 at 0- days (likely to be living independently at those scores) was 32.6% vs 19.1 % Odds ratio 2.16 (CI 1.39-3.38) which if borne out in later studies is arguably clinically significant. @docib has asked for the numbers as Numbers Needed to Treat (which he can work out for himself after following the stemlynspodcasts on the subject), so just for Iain it’s about 7.5 patients treated to get one additional modified Rankin score of 0-2 (i.e. a good outcome). Pretty impressive (though the confidence intervals are wider than that of course). You may be wondering about early deaths as that has been an issue in thrombolysis trials (same number of deaths but you die sooner with thrombolysis). The data here suggests that at 7 days there is little difference (11.6% vs 12.4%). It’s the first RCT of interventional radiology to show a difference so we should be cautious about getting too excited here. Both the discussion and the authors conclusions are well measured and show an understanding of the limitations of this trial. 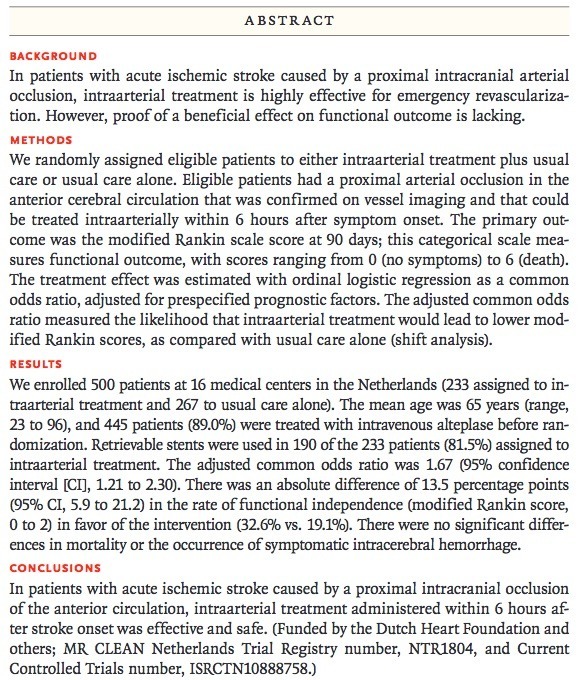 The conclusion, that this trial demonstrates that interventional radiology for stroke (in this subset) is effective and safe is reasonably fair. Without a doubt we will see more trials in this area soon. Ryan Radecki at EMLitofNote has already blogged on the trial and makes some great comments. He points out the overall poor prognosis for all patients in the study as compared to NINDS, though that may be due to different patient populations (nobody was thrombolysing TIAs in this study), you should Ryan’s comments too. I completely agree that this study may precipitate a rush of interest, whether such enthusiasm will stand the test of validation we must all wait and see.